Korean commuters battle zombies on a high speed train. Train to Busan is what World War Z should have been - a nightmarish vision of the end of the world, yet boasting an emotional core that big-name, multi-million-dollar spectacle somewhat lacked. I usually have a bit of a problem with Zombie movies – I find them dull. Yes, I know Zombie fans will be throwing their Walking Dead box sets at my head (and those are some hefty tomes) but I find that, although they may be a popular horror monster, zombies are forced to rely heavily on the cheap, gross-out factor in order to distract from the fact that they have scanty horror mileage, no rich mythos to draw on and offer little scope for variation, tension or development. I am left to suppose that Zombie fans are in it for the fashion statement. Understandably, any Zombie movie worth its salt tends to concentrate on the reactions of the (still) human characters and their survival tactics. 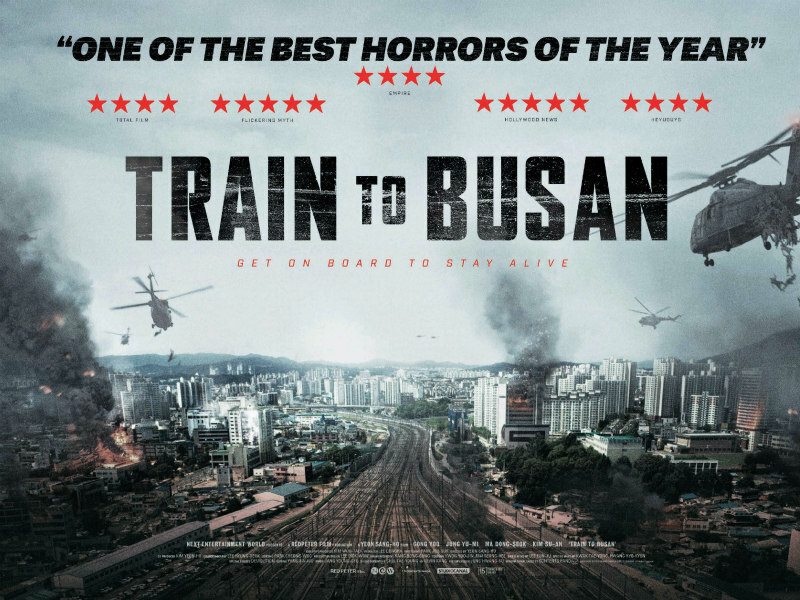 I am however, an Asian horror enthusiast, so when Korean animator Sang-ho Yeon tackled the Zombie genre in his first live-action feature, Train to Busan, I was willing to give it a look. I was not disappointed. Trust the Koreans to come up with an entertaining and engaging take on a near-to-worn-out horror genre. Train to Busan‘s ominous introduction gives us a deer, knocked down by a truck driver in a quarantine zone near Seoul where some kind of chemical spill has occurred (echoes of Bong Joon-ho’s 2007 enviro-horror The Host). As the camera lingers on its flattened body, slowly and jerkily it staggers back to life, blood splattered and with vacant, clouded eyeballs – it’s Bambi gone bad. The movie (although excellently paced) takes time to establish its core characters — namely a workaholic hedge fund manager and soon-to-be divorced dad Seok Woo (Gong Yoo) and the neglected young daughter Soo-an (Kim Soo-an) he has promised to take to visit her mother, now residing in Busan, a city at the other end of the country to Seoul. Before they board the high-speed train, there are already hints of unrest; the increasing violence seen during “workers’ strikes” is the main topic on TV screens throughout the station. When one infected passenger sneaks aboard and then undergoes the horrific transformation, an infected and homicidal contingent soon begins to spread throughout the carriages. The high-class passengers don’t get the ride they paid for when they find they have to contend with the cheap seats housing an increasing horde of murderous zombies. Yeon’s zombies are pretty striking – they are fierce, fast-moving creatures, all chomping, bloodied teeth and protruding Ping-Pong ball eyes. They attack in seizures of jerky, sclerotic energy like the break-dancing zombies of Michael Jackson’s Thriller video. Mercifully, they have forgotten how to operate train carriage doors and are mostly blind, so tunnels and lines of sight become key advantages for the escapees. The drama of group dynamics takes over and Yeon gets mileage — both comic and tragic — out of the dwindling survivors’ responses to the crisis. Running alongside the violence and mayhem is a thread of social commentary - we have characters who will selfishly strive to survive at the expense of their fellows, while others altruistically do whatever is necessary to save their companions. As the zombies chow down and multiply, a variety of individuals ward them off - diverse enough characters that rarely degenerate into stereotypes, although some serve to further the critique of corporate callousness. Although it may lack some of the more subtle layers evident in Yeon’s acclaimed animations (such as the thematically-linked Seoul Station), Train to Busan provides a commentary on the country’s class system and the toll that the national emphasis on work and industriousness can take on family life, as well as also overtly referencing the Korean government’s response to the MERS virus. Emotionally, this Korean Zombie movie operates on a different level to western counterparts. 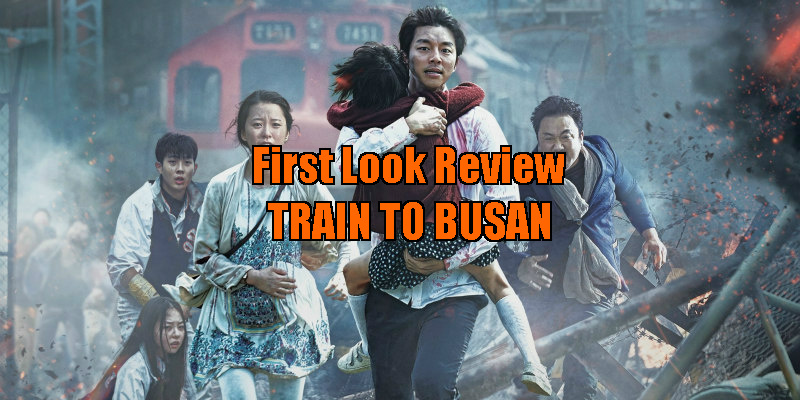 Train to Busan is thematically stronger than your average zombie flick. We become fully engaged with the principal characters - we empathise with their dilemmas, live through their difficult decisions, we side with them, root for them, cry for them. We are appalled by the way the movie captures how panic can make monsters of us all. Early in the film, Seok-Woo tells his daughter, “At a time like this, only watch out for yourself,” but her reaction informs him that this is not the advice she wants to hear from her father. Social commentary aside, Train to Busan is also a wildly entertaining action movie, well paced and constructed - it never lets up. Just when one crisis is overcome, another is building. 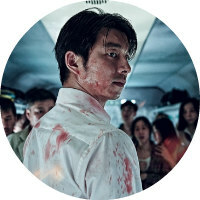 Frenetic but never disorienting, the movie’s bold set pieces (like a lengthening, writhing ribbon of zombies clinging doggedly to the end handrail of a train transporting a handful of survivors) owe much to Lee Hyung-deok’s agile cinematography. His nifty camerawork dips and rises, infiltrating into tiny washrooms and luggage compartments, scanning deserted concourses and dark tunnels, providing an exhilarating vigour to the action scenes. Train to Busan is what World War Z should have been - a nightmarish vision of the end of the world, yet boasting an emotional core that big-name, multi-million-dollar spectacle somewhat lacked. Without giving out spoilers, Train to Busan suggests it's those who trample over others to save themselves who will ultimately lose out and that the survivors of horrors are only there because of the sacrifices of their fellow man. During our darkest days is the time that we most need to look out for each other.